Bitcoin has been limited to a fixed trading range in the past 24 hours, with yesterday’s $3,869.49 daily high serving as the first resistance level, and today’s $3,463.96 daily low, holding as the bottom end of the range. Despite the rise in price, volume appears to be tapering off on Bitstamp. 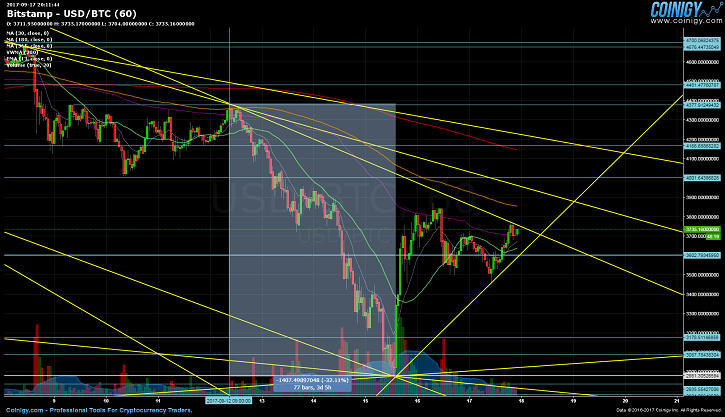 We will need to see a breakout above the existing trend lines, the daily high, and lastly the $4,000 price level, before confirming a completely new bull-run. China cannot seem to leave the spotlight, with the noise from the ICO bans and exchange shutdowns, still profoundly resonating across the internet. Even mainstream media is drawing attention to the matter, with Bloomberg releasing an article quoting the BIS, on matters relating to bitcoin. The other side of the spectrum has its share of naysayers as well, Professor Steve Hanke being one of them, an American applied economist at the Johns Hopkins University in Baltimore, Maryland. With hundreds of ICOs to choose from, it is not surprising that countless new bitcoin and crypto millionaires, are using these startups as pass-through tax vehicles. Business Insider delves into more detail on the subject in a recent article. Furthermore, companies such as CryptoPay are also deciding to host an ICO, mainly for expansion purposes. This was a surprising announcement to say the least, especially coming from a firm that was content with focusing on debit card and payment processing. It is understandable that the many people, who are new to the space, would flock to this form of crowdfunding. Trading requires ample patience, nerves of steel, and quite a bit of prior practical experience, not to mention how immensely mentally draining the whole endaveur often ends up being. Regardless, new users should be aware that partaking in such enterprises locks in funds, which could otherwise be available for other purposes, and recovering an investment can lead to OTC trading at heavily discounted rates, as the only available exit strategy. Only a year has passed since bitcoin’s market cap was below $10 billion, when the first crypto currency held an overwhelming advantage over competing alternatives, quite a far cry from the September 1 record breaking $80 billion market cap. Exactly one year has passed since the 80% market share was all too common, with even the 90% threshold, not being too far from reach. The many elapsed months of volatile trading, have pushed bitcoin dominance downward, keeping it close to an approximate 50% market share most of the time. Bitcoin started trading from the $2,972.01 weekly low on September 12 (GMT 07:00). The run-up continued until yesterday’s $3,869.55 daily high was realized. Trading has in the meantime, remained confined to today’s $3,463.96 daily low, and considerably beneath yesterday’s daily high.